JNN 25 Feb 2015 Tehran : An American lady, “Elina Emily”, converted to Islam in Imam Reza (AS) holy Shrine on Thursday, and then adopted Zaynab as her new name. “4 years ago I began researching on Islam. Since then I’ve found that Islam is a comprehensive religion,” Emily said. “Unfortunately, what is being available for the modern followers of Jesus and Moses, as the Bible and the Torah, are distorted books and no longer God’s word. So they do not have the comprehensive book that we have in Islam,” Emily added. RTL Radio in France revealed that the number of converts to Islam has dramatically increased after the attack on Charlie Hebdo magazine office in Paris. The Grand Mosque of Paris reported a rise in the number of granted “Conversion to Islam Certificates”, which reached 40 in January 2015 compared to 22 certificates granted in January 2014. A number of major French cities, such as Lyon and Strasbourg, have also reported a surge in number of people converting to Islam. In the wake of the terrorist attack in Paris, the Muslims in France were concerned that the incident would once again create an atmosphere of Islamophobia in the country. Despite all the problems, there was an unprecedented increase in sales of copies of the Qur’an over the weeks that followed the attack, and there was unexpected increase in conversions to Islam in France, RTL Radio confirmed Wednesday, based on its own sources. Mosques in major French cities have also seen similar rise in number of converts to Islam. RTL reported a rise of 20 percent in number of Muslim converts in Lyon and Strasbourg, compared to the previous year. 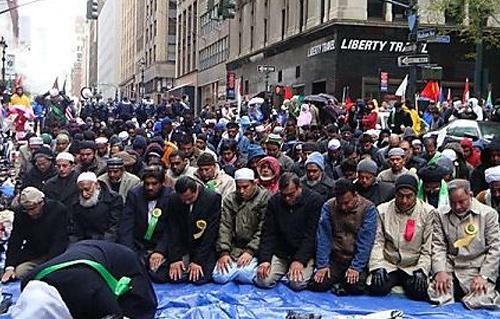 The radio also cited a number of Imams, who unanimously agreed that they had never seen such a rush to convert to Islam in France. An official at the Paris Mosque stated that the converts to Islam represented people from all walks of life, including principals, teachers, policemen and doctors, etc. This entry was posted in America, Europe, United States. Bookmark the permalink.